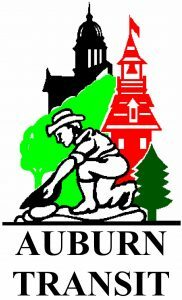 The City of Auburn Department of Public works operates Auburn Transit. Auburn Transit provides two deviated fixed routes weekdays from 5:50 a.m. to 6:30 p.m., and one deviated fixed route on Saturdays from 9 a.m. to 5 p.m. These interlinking routes will deviate from the scheduled route up to ¾ of a mile upon a reservation request, scheduled at least two hours in advance. This deviated fixed-route service fulfills the Americans with Disabilities Act (ADA) requirement for complementary paratransit service. The vehicles are equipped with a cellular phone, which allows passengers to contact the drivers directly for demand-response service. Auburn Transit is based around the Auburn Multi-Modal Station located on Blocker Drive near Nevada Street. The Auburn Multi-Modal Station provides a transfer point from Auburn Transit to Placer County Transit, Nevada County’s Gold County Stage, and CTSA service. Lincoln, Rocklin and Sierra College. As of July 1st 2015, Placer County will provide transit services within the City of Lincoln. The agreement agreement between Placer County and the City of Lincoln offers several advantages, including lower fares for passengers, economies of scale and improved coordination of transit services within western Placer County. The Lincoln Circulator fixed route and Dial-a-Ride services are now available on Saturdays. PCT contracts Dial-A-Ride service and the Taylor Road Shuttle to PRIDE Industries. Dial-A-Ride provides service based on reservations directly to requested destinations within the service area. Dial-A-Ride is provided in Auburn in the Highway 49 Corridor, Lincoln, Loomis, Rocklin and Granite Bay. The Taylor Road Shuttle provide service to Newcastle, Penryn and Loomis from Auburn to Sierra College in Rocklin. The City of Roseville Department of Public Works is responsible for providing transit service within the City of Roseville. The City owns and maintains the bus fleet and contracts with a transit provider for the daily operation of Roseville Transit. Roseville Transit is comprised of three modes: a fixed route service with thirteen local routes operated throughout the City, as well as a peak hour employee shuttle; Dial-A-Ride, a city-wide demand-response service open to the general public; and a weekday peak-period commuter service from park-and-ride facilities within Roseville to downtown Sacramento and to the Highway 50 corridor (as well as a reverse commuter service using the same commuter buses). All services operate weekdays, from 6:00 am to 7:00 pm., except the Commuter service, which operates from 5:00 am to 9:00 am and from 3:30 pm to 7:00 pm. The fixed-route service (except for the peak hour employee shuttle) operates on Saturdays, while the Dial-A-Ride operates on Saturdays and Sundays. Dial-A-Ride services operate on Saturday and Sunday from 8:00 am to 6:00 pm. Roseville Transit provides connections with Placer County Transit (PCT) and the Sacramento Regional Transit District (RT) at designated transfer points in Roseville. Commuter services also have selected transfer points with light rail services provided by RT and with bus service provided by Yolobus to the Sacramento International Airport. TART operates public bus transit service in North Tahoe. TART’s “Mainline” route runs year-round between Tahoma on the Westshore to the Hyatt in Incline Village. The route serves Tahoe City, Kings Beach and all of the other communities along this route. TART also operates route service between Tahoe City, Squaw Valley and Truckee. In the summer time, TART adds the Tahoe Trolley service, which increases daytime service and adds nighttime service. In the winter and summer, TART adds a route on Highway 267 between Truckee, Northstar, and Kings Beach. The Placer County Transportation Planning Agency (PCTPA) has designated the Western Placer Consolidated Transportation Service Agency (WPCTSA) as the Consolidated Transportation Service Agency serving western Placer County. The WPCTSA is a joint powers agency with the power to provide and coordinate social service transportation for the western portion of Placer County, including services for the elderly and individuals with disabilities. WPCTSA services went into effect in January 2009. WPCTSA programs are intended to provide transportation services for Placer County residents who are not able to use conventional public transit services operating within western Placer County. Each program responds to a unique transportation need not otherwise currently met or met well within a prescribed service area. WPCTSA currently collaborates with Seniors First, Inc., a local non-profit organization, to fund various programs. The My Rides program expands upon 40-years of connecting Placer County residents to destinations they would not otherwise be able to access with the traditional public transit system. The expanded program makes door-to-door services available to residents throughout Placer County, including areas such as North Tahoe, Sheridan, and east of Colfax to the I-80/SR-20 Interchange near Yuba Gap. Residents can enlist a relative, neighbor, friend, or a pool of volunteer drivers to get them to non-emergency medical appointments, public assistance, and quality of life types of services. The volunteer drivers can be reimbursed for their mileage upon submittal and approval of a volunteer driver application. The My Rides Program helps individuals get to where they need to go and support those volunteers willing to get them there! For more information on scheduling a ride please call 530-889-9500 ext.201 in the Auburn Area or 916-782-4202 in the Roseville area or visit www.seniorsfirst.org/myrides. For information on volunteering please call 1-800-878-9222 ext. 213 or visit www.seniorsfirst.org/volunteer. Each year, PCTPA works with the transit providers and the public to identify any transit needs that are not currently being met. For more information on the annual Unmet Transit Needs process, see our Unmet Transit Needs page.